60 St Giles High Street, London WC2H 8LG. Tickets £10. Christmas is just around the corner and what better way to celebrate than bringing people together with music. 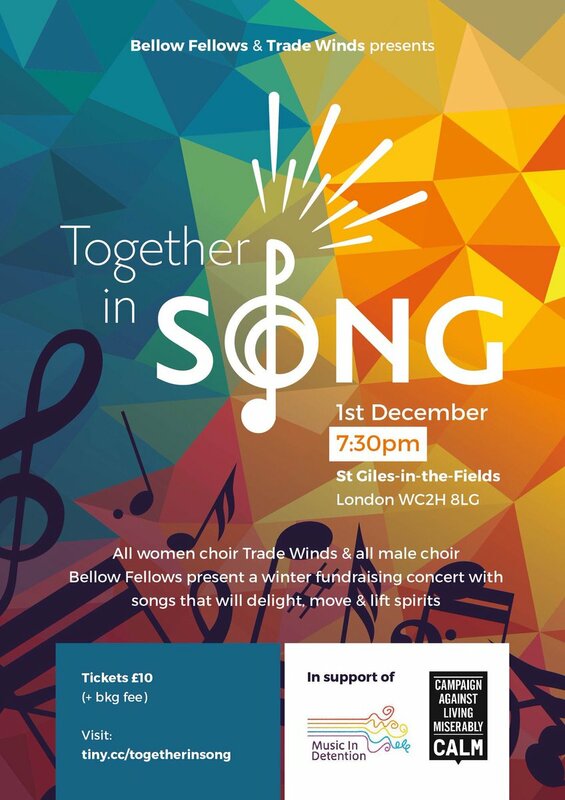 With this in mind, Trade Winds Choir will join hands with Bellow Fellows, London’s male voice community choir, on 1 December 2018 at St Giles-in-the-fields under the name of Together In Song. The two choirs will raise money to support two charities, Music in Detention and CALM. Here at Music in Detention, we are so thrilled and thankful to Trade Winds Choir and Bellow Fellows for supporting us with our mission of bringing people in immigration detention centres together through music, and platforming their voices to be heard outside detention walls. For more information and book your ticket click here.